Mark Luger has been teaching private music lessons for 20 years. Many of the students he has taught have achieved outstanding results. See the partial list of achievements of students who have taken lessons from him. gr 12 and four years study at St. John’s University, Collegeville, MN. Dr. Knuesel studied under Daniel Deffayet, Professor of Saxophone, Paris Conservatory of Music, and she was the first American woman to win the first prize in the ‘Concours’. It is the final exam in which you are pitted against all of the rest of your classmates who are the best in the world’s foremost school for classical music. If the judges don’t feel the competition level is high enough, they will occasionally award only a second prize. Dr. Knuesel went on to perform at Carnegie Hall. She is now provost of The College of St. Benedict and St. John's University. 1984 (gr 9) selected to receive master lessons from Daniel Deffayet (Professor of Saxophone, Paris Conservatory of Music) at St. John’s University, who was at that time considered one of the world’s foremost teachers of saxophone. First chair alto saxophone in Twin City Institute for Talented Youth 1985 summer program in the Jazz Ensemble directed by Denny Malmberg at Macalaster College. First chair alto saxophone 1986-87 Minnesota All-State Jazz Ensemble. Selected as Minnesota Governor’s Scholar 1986-87 for an independent study to develop a program for learning saxophone for beginning saxophone. 1987 received the Arion Award, the oldest (established in 1948) and one of the most prestigious national awards for outstanding achievement in band, chosen by fellow band members and awarded to only one Senior band student each year. 1989 (a Junior at St. John’s) selected to receive master lessons from Daniel Deffayet (Professor of Saxophone, Paris Conservatory of Music) at St. John’s University. 1990 employed to play alto saxophone in Bizet’s “L’Arlesienne” with the Heartland Symphony Orchestra in Brainerd. 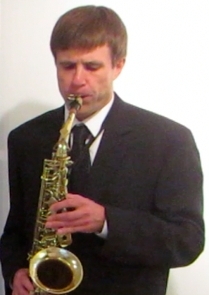 Graduated with a Bachelor of Arts in saxophone performance from St. John’s University, Collegeville, MN in 1991. While at St. John’s studied piano with Dr. Edward Turley for four years (achieving a certificate in piano proficiency), composition with Dr. Jerome Coller, and violin with J. J. Swift. 1997-98 served as the saxophone section coach for the Minnesota All-State Concert Band. Performed alto saxophone with the Minnetonka Symphony Orchestra in “American in Paris” and also in “Rhapsody in Blue” by George Gershwin. 2005 received master lessons from Dr. Eugene Rousseau, recently retired from the University of Minnesota School of Music. Dr. Rousseau has, more than any other saxophonist, had the greatest impact on saxophonists literally all over the world. “He was the co-organizer of the first World Saxophone Congress in 1969, the first such organization for an individual instrument, and considered to be a major turning point in establishing credibility for the saxophone as a serious medium of musical expression.” His world-wide accolades are too numerous to mention here. (see source: Wikipedia and visit Dr. Rousseau’s website). In 2008, 2009, 2010 and 2012, attended the Composers Institute directed by Aaron Jay Kernis and hosted by Osmo Vanska and the Minnesota Orchestra. Member of American Composer’s Forum.